Well, I’m a twit now. It seems that twitter is taking over blog feeds and blog comments. So, I’m now @MJonMoney on twitter. I take pride in my ability to be clear and concise, but the 140-character limit is a challenge. Here’s hoping that this leads to more useful interaction with my readers. Feel free to tell me what I’m doing wrong on twitter as I muddle through. My goal is to make my ideas conveniently accessible to people who want to read them without too much shameless self-promotion. Have a great New Year’s Eve party. Saving tip: to spend less on pills tomorrow, drink less tonight. Just in case you need a reason to save more of your hard-earned money instead of buying yet another electronic gadget or pair of shoes, here’s a good one: the TFSA and RRSP contribution room you didn’t use in past years has been shrinking. Perhaps when you decided you didn’t have enough money to save any in a tax shelter last year you felt safe knowing that you’d be able to use the room in the future. Some magical time will come when you can save enough money to use up past room. But the trouble is that your available room has a leak. Dollars this year are worth less than dollars last year, and those dollars are worth less than they were the year before. So, let’s stop talking about dollars and start talking about loaves of bread (as a proxy for the cost of living). Suppose that your $5000 TFSA allotment from 2009 amounted to 2500 loaves of bread. The Consumer Price Index (CPI) in Canada has gone from 113 to 123 since the start of 2009. If you haven’t used this 2009 TFSA room yet, then it is only 2297 loaves of bread now. You’ve lost 203 loaves of TFSA room. Even though it’s not obvious, contribution room in both TFSAs and RRSPs have a slow leak. If inflation rises in the future, this leak gets bigger. Genuine hardship is a good reason to put off saving, but eating out and buying junk are poor reasons that are costing you money in more ways than one. The Blunt Bean Counter explains how being named an estate executor can leave you handling two estates at once. My Own Advisor did a 2013 retrospective of his favourite posts each month. Getting into the Grinchy side of the Christmas spirit, I thought I’d take a look at how both income taxes and mutual fund fees affect TFSA savings. The effects of these costs will vary considerably from one person to another, so we’ll just look at one particular case. From stage left, our saver Sally enters. She saves $5000 in her TFSA every year (rising with inflation) starting from age 25 until she retires at age 65. We’ll assume that she makes a return of 4% above inflation each year (before fees). From age 65 to 85, she draws $15,000 per year to live on (in today’s dollars). 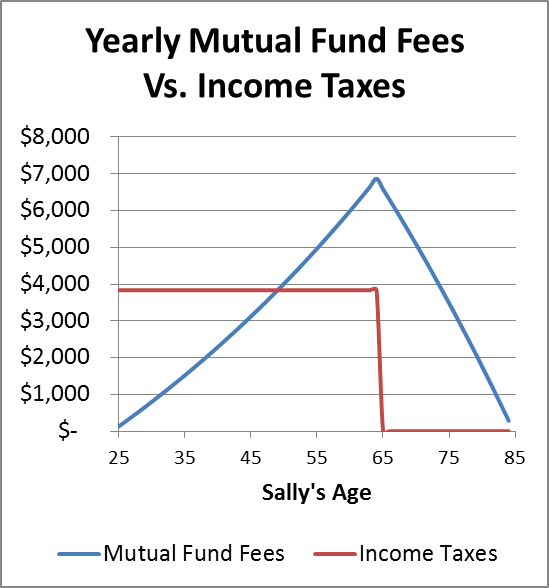 For Sally’s tax bite, we’ll look at how much income she had to earn to make the $5000 TFSA contribution. Let’s assume that Sally lives in Ontario and earns between $87,907 and $136,270 so that her marginal tax rate is 43.41%. This means she has to earn $8835 to get $5000 after income taxes. This makes the tax bite on her TFSA contribution $3835 per year. By the time Sally is 50, her savings take a bigger hit from mutual fund fees than income taxes. Over the full 60 years, the income tax total (in today’s dollars) is $153,419. But the total mutual fund fees (again in today’s dollars) are a whopping $199,163! It seems hard to believe that a seemingly tiny 2.5% MER could amount to more than a 43.41% income tax rate. The important difference is that the income taxes apply each year only to the TFSA contribution; each dollar only gets taxed once. With the mutual fund MER, each dollar is hit every year for as long as it stays invested in the mutual funds. The moral of this story is that when it comes to investing, costs matter. Preet Banerjee explains his decision to rent instead of buying a home. Canadian Couch Potato explains how the slim chance of outperforming the market gets in the way of investors embracing index investing. Potato asks why do pensions exist if the future is discounted? A good question. I offered possible answers in the comment section. Boomer and Echo explain the CPP child-rearing dropout provision you may be able to use to increase your CPP benefits. I didn’t know that this dropout could be used by either parent. Big Cajun Man says you should scan your bills instead of keeping a bunch of paper around. Fortunately, I’m getting a lot of my bills electronically now. But most of my receipts that are relevant for income taxes are still on paper. The Blunt Bean Counter is trash-talking auditors saying that they are more boring than tax guys in his post explaining financial statement reports. My Own Advisor goes through his planned year-end financial planning. Canada’s pension system is in trouble and we need to do something about it. This is the main message of the book The Third Rail, written by Jim Leech, CEO of the Ontario Teachers’ Pension Plan, and Jacquie McNish, senior writer with the Globe and Mail. The book is a fairly easy read and is worth a look. The authors take a detailed look at pension crises in New Brunswick, Rhode Island, and The Netherlands, and describe how the problems were solved. A common theme is that the pension plans were changed to make benefit levels conditional on the returns on pension assets. On one hand this makes a lot of sense. We can’t expect pension backers (taxpayers or companies) to grow benefits faster than they can grow the savings set aside to pay those benefits. On the other hand, if we make cost-of-living increases conditional on pension asset returns, this automatically takes the pressure off pension administrators to manage the funds well. They can award themselves excessive fees or allow companies and governments to take pension contribution holidays, and the automatic reductions in cost-of-living increases will cover up the abuses. If pension benefits are going to be conditional, we need plan administrators to have strong financial incentives to run the plans efficiently and effectively. Turning to the pension situation in Canada, the authors tell a parable about a farmer whose most productive cow dies. A chance encounter with a magic fish grants the farmer a wish. Does he wish to have his cow back? No, he says “I want my neighbour’s cow to die!” The authors claim that this is “the social dynamic of the pension debate” in Canada. Those who have no pension want to take away others’ pensions. The authors think we should instead try to build a strong pension system for all Canadians. So the authors accuse Canadians of spitefulness, but I have practical concerns. If we take federal public servant pensions as a model, can we afford to extend such a plan to all Canadians? I think not. According to Statistics Canada, the average federal public servant retires at age 58, and only about 55% of the Canadian population is between 20 and 58 years old. If we eliminate the unemployed and those who cannot work, less than half of Canadians would be working, and this fraction will continue to decline over time. Do we really think we could run our economy including distributing food and other goods and keeping golf courses manicured if less than half of Canadians are working? The only logical conclusion is that if we are going to design a pension system covering all or almost all Canadians, it cannot be as generous as federal public service pensions. We need a system that encourages Canadians to work later in life. The authors describe a “longevity pension” being considered in Quebec where benefits begin at age 75. This would be in addition to QPP which generally begins around age 65. This kind of proposal makes sense to me. It says, we’ll take care of you after age 75, but if you want to retire earlier, you need to save some money. Instead of expanding the existing CPP, I like the idea of creating another system that only pays benefits after age 75 and is entirely pre-funded. The idea is that you only get benefits in proportion to the amount you pay in. Young Canadians today could look forward to knowing that they’ll be taken care of after age 75. Until then, they have to work or save enough to live on until they reach 75. In a discussion of expanding CPP, the authors suggest that “Ottawa could consider speeding up the delivery of enhanced pensions by temporarily bridging the gap to fully fund the new benefits.” Put another way, Ottawa could take some of the increases CPP payroll deductions of young people and give it to current retirees. I’m opposed. In contrast, “the typical defined benefit pension fund management expense ratio of 0.4 per cent” consumes only 15% of assets after 40 years. This is obviously far better, but still seems high when we see that Vanguard manages to run funds with much lower expenses. Perhaps pension plan administrators face costs that Vanguard does not. In summary, I think the authors are right that we need to face our pension problems. They are right when they say that existing defined benefit pensions have sustainability issues. They are also right when they say there is a problem with so few younger Canadians covered by pensions. However, if we are going to have mandatory pension systems (like CPP), the focus should be on large enough benefit amounts to provide a decent standard of living but starting late in life (at least age 75). Attempts to shift money around to give us all great pensions in our late 50s or early 60s are doomed to failure. A very thoughtful post over at How to Invest Online looked at the opinions of various investment theory heavyweights on the question of whether owning an index of stocks becomes more or less risky the longer you hold them. I want to address the argument that because “the spread of possible ending dollar values get wider, not narrower, with time,” stocks keep getting more risky over time. At its core, this argument is playing a semantic game with the word “risk”. 1or2 investment: Each month you toss a fair coin. If it comes up tails, you get a return of inflation+1%. If it comes up heads, the return is inflation+2%. This looks like a fantastic investment. After one year, you’ll beat inflation by between 12.7% and 26.8%. Even the worst-case scenario gives a better return than most of us could possibly hope for. The 1or2 investment is risk-free in the every-day sense of the word “risk”. If we use the technical definition of “risk” commonly used in finance, we need to look at volatility and standard deviations. Over one month, the standard deviation is about 0.5%. After a year, the standard deviation goes up to 1.7%. At a decade, it’s 5.5%, and after 50 years it’s 12%. The longer you hold the 1or2 investment, the riskier it gets, in a technical sense. It’s clear that the every-day meaning of “risk” is different from the technical meaning used in finance. -2or3 investment: Each month you toss a fair coin. If it comes up tails, you get a return of inflation-2%. If it comes up heads, the return is inflation+3%. Just as with the 1or2 investment, the -2or3 investment’s standard deviation keeps rising the longer you hold it. 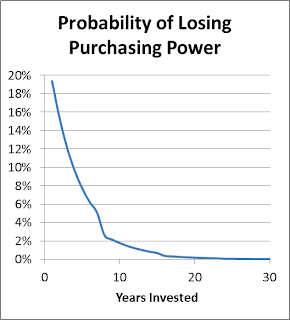 However, what if we focus on the probability that the portfolio will lose purchasing power over different holding periods? The following chart shows that the probability of losing purchasing power drops over time. After 30 years, the probability that the -2or3 investment will lose out to inflation is less than 1 in 5000. So, if you’re trying to decide whether the -2or3 investment gets riskier the longer you hold it, which of the following facts seems more relevant? 1. The standard deviation keeps getting larger the longer you hold the -2or3 investment. 2. The -2or3 investment is expected to beat inflation by 5.8% per year, and the probability that it will lose to inflation over 30 years is less than 1 in 5000. At this point Boston University professor Zvi Bodie would argue that with real stocks, the odds of losing money increases the longer you hold them. His justification is that option prices rise with the length of the term. However, the Black-Scholes pricing model does not even take into account the expected return of an investment. This means that the Black-Scholes price of using options to insure against losses with the 1or2 investment would rise with time as well, even though there is no risk of loss with this investment. The bottom line is that if we’re going to talk about whether stocks are risky over the long run, we need to be precise about what we mean by “risky”. The way that most non-specialists would interpret this question, I think the correct answer is that beyond a certain holding period, owning stocks starts becoming less risky. Update: With the help of some readers, the problem appears to be solved. Thanks to all! Writing this blog has been a great journey for me that I’d like to continue. However, I’m caught in the strange situation of being unable to renew my domain registration. It’s only $10 or so, but after sinking about 15 hours of my time over the past month into trying to get Google to take my money, I’ve made no progress. I’ll describe the gory technical details at the end of this post. It’s not that my blog will disappear entirely, but I would have to go back to the old Blogspot address or try to register some new domain name. Either way I’d be facing losing my current PageRank which would lead to big loss in readership. I’m not sure yet if I’ll want to continue writing with this kind of setback. Other bloggers have tried hard to get me to leave Google’s Blogger and use WordPress. I have little doubt that WordPress is usually easy to use and has powerful features. However, when I ask bloggers to tell me about any IT problems they’ve had recently and what they had to do to fix these problems, I get answers that make it obvious to me that I would never do what is necessary to keep a WordPress blog going. It’s not that I don’t have the technical background to fix IT problems. The trouble is that while many of my technical friends get a lot of satisfaction from tracking down and solving computer problems, I detest doing this kind of work. I like math and finance, but fixing computer problems ranks somewhere below cleaning toilets for me. I still have lots of things I’d like to write about. 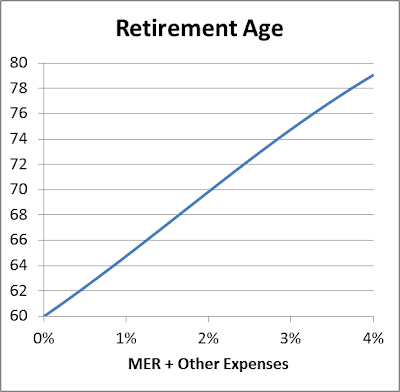 Of particular interest to me is recent work I’ve been doing on the best ways to turn a retirement lump sum into a lifetime of monthly spending. I want to be able to figure out when I think I’ve achieved financial independence. The threatened cut-off date from Google is Friday, December 13th (fitting, eh?). I will continue trying to resolve this, but if my blog goes dark on the 13th or sometime shortly thereafter, you’ll know why. This story began Nov. 13th with an email from Google complaining that the payment for automatically renewing my domain registration for michaeljamesonmoney.com failed. One of the suggested causes was an expired credit card. This made sense because I did get an updated credit card recently. So, I went to https://www.google.com/settings/account, clicked on Dashboard, signed in, found Wallet/Checkout, and updated my credit card details. Problem solved, I thought. On Dec. 5th I received another email from Google saying that the registration payment failed. I checked my credit card details (they were correct). I then checked with my credit card company to see if they had rejected any charges (they hadn’t). Just in case this is the problem, I’ve entered a different credit card. You are trying to access Google Admin of michaeljamesonmoney.com but you do not have a valid logged in account for it. I have 3 different Google identities, but I get this error message for all three. I’ve tried on two different computers without success. So, there you have it. If you’ve read this far and have an idea of how I can fix this or how I can talk to an actual human at Google, I’m interested. The book Tax-Fee Savings Accounts – How TFSAs Can Make You Rich, by Gordon Pape, is a very useful guide to TFSAs. Broadly-speaking, the book contains two types of content: 1) easy-to-understand descriptions of the various TFSA rules and 2) advice for how to use a TFSA. The descriptions of the rules are excellent. The advice contains both good and bad parts. This book is useful for financial novices as well as experts. I won’t discuss the material aimed at novices any further in this review. Instead I’ll discuss parts that I found interesting and parts where I disagreed. “Never contribute a money-losing security directly to a TFSA. Sell it first, thereby creating a deductible capital loss, and then put the cash from the sale into the plan.” When you deposit stocks directly into a TFSA, the stocks are deemed to have been sold. You would have to pay capital gains taxes on any gains, but capital losses are not allowed. You can’t “rent” TFSA room. Elaborate schemes using loans designed to allow one person to benefit from another person’s TFSA room are not permitted. “Every dollar of income from [an RRSP or RRIF] reduces a Guaranteed Income Supplement benefit by 50 cents once the $3500 exemption has been exceeded.” This isn’t about TFSAs, but that $3500 exemption is important to factor into tax planning for low-income Canadians. “Tax experts warn not to name your spouse/partner as a beneficiary but rather to use the successor holder designation” (except in Quebec). The important difference is whether the spouse gets to move the TFSA contents into his or her own TFSA without using up any of his or her own TFSA room. My biggest criticism is Pape’s repeated statements showing a misunderstanding of the comparison between RRSPs and TFSAs. (I wrote about this in detail here and here.) No doubt Pape’s words will resonate with some people because over time they come to think of their RRSP assets as entirely their own, even though they received tax breaks in the past. The tax breaks enable people to contribute more money to an RRSP than they could contribute to a TFSA. Pape’s claim that RRSPs do not allow “us to obtain the full benefit of compounding” is simply not true. His advice to a 22-year old to “begin with an RRSP rather than a Tax-Free Savings Account because of the tax deduction” is bad advice if this young person’s income is low enough that the tax deduction is nearly worthless. Many young people are better off starting with a TFSA and waiting for higher income to open an RRSP. Referring to a table of taxes paid on RRSP withdrawals, the figures “do not make provision for special tax treatment, such as the 50-percent capital gains rate.” I have no idea why capital gains taxes would be relevant to RRSP withdrawal income. “Avoid speculative stocks and high-volatility mutual funds and exchange-traded funds.” There are so many types of ETFs that they couldn’t possibly be either all good or all bad. Further, Pape recommends certain ETFs at another point in the book. Another category of concern I have about this book is the active investment advice. The book contains promotions of Pape’s subscription-based investment newsletters. Presumably, the tidbits of advice he gives are a sample of what’s in the newsletters. In one section he profiles a fictional couple who are savvy enough to “generate an average annual return of 15 percent on their money” for 30 years. In an environment of 2% to 3% inflation, this is unrealistic. Other advice to “choose companies that are industry leaders, have a well-established history of surviving even the toughest times, and are trading at the low end of their normal range” is just simplistic. Pape perpetuates the myth that individual investors who work hard can expect to beat the markets by a wide margin over extended periods of time. The parts of this book that deal with TFSA rules and strategies are well written and easy to understand. Some parts of the advice offered are excellent as well, but other parts are misleading or just plain wrong. When comparing TFSAs to RRSPs, it’s important to consider only the after-tax portion of your RRSP balance or you’ll be led astray. The concept of forgone consumption is helpful. Here I look at how to compare TFSAs and RRSPs when it comes time to draw from them in retirement. Q: I expect to run out of non-tax-sheltered investments in about 5 years. When this happens, should I start drawing from my RRSP or TFSA? A: “Let’s suppose you have a $5000 investment in each plan earning 7 percent annually. Five years from now, that investment will be worth $7012.76. Now you are faced with a withdrawal decision. If you take the money from the RRSP, using a marginal tax rate of 30 percent, you will be assessed $2103.83 on the withdrawal. That will leave you with a net after-tax return of $4908.93. Note that is less that the value of the original $5000 investment, which means that all the income you earned over the five years and more went in taxes. By comparison, a TFSA withdrawal will be worth the full $7012.76 – you keep all the investment income. It’s hard to decide where to begin with this muddled answer. Pape is saying that if you are comparing equal-sized withdrawals from your RRSP and TFSA, drawing from the RRSP will leave you with more TFSA funds that are more valuable because they won’t be taxed in the future. This is hardly surprising when we compare drawing equal-size amounts from each plan, because drawing from the RRSP will leave you with less money to spend this year due to income taxes. In effect, it is a smaller withdrawal, so it makes sense that you’re left with more money afterward. Presumably, the reader is making withdrawals because he or she wants a certain amount of money to live on. For someone in a 30% tax bracket, a $7000 withdrawal from a TFSA should be compared to a $10,000 withdrawal from an RRSP. Pape’s comparison is simply irrelevant. The observation that 5 years of growth in an RRSP doesn’t cover the taxes that will be charged on withdrawals is unhelpful. The original $5000 should be thought of as $3500 for the reader and $1500 for CRA. Viewed this way, both parts grow together and the reader can think of his or her part as growing tax-free. The real answer to the reader’s question is complex. In some cases it makes sense to draw from both the RRSP and TFSA to keep taxable income steady over the years and avoid getting into a higher tax bracket. For low-income earners, it can make sense to draw the entire RRSP in one or two years (and move it to the TFSA if there is room) so that they can collect the full GIS in future years. For high-income earners trying to avoid OAS clawback is a consideration. Answering questions like this without adequate details from the questioner is challenging because the answer usually ends up beginning with “it depends ...”. In this case Pape’s answer seems unhelpful no matter the circumstances. People tie themselves up in knots trying to compare RRSPs to TFSAs. Even well-known author and newsletter publisher Gordon Pape has some difficulty. The idea of forgone consumption helps to simplify things. It’s important to understand how much you’re really saving when you put money in registered accounts. With TFSAs, the situation is simple. If you deposit $3000, then you’ve saved $3000. RRSPs are more complex. If you’re in a 40% tax bracket and deposit $5000 in an RRSP, you’ll get $2000 back in taxes. Your forgone consumption is only $3000. RRSPs are easier to understand if you think in terms of only having saved $3000. Think of the other $2000 as belonging to CRA. Suppose that over 30 years your money grows by a factor of 10. Your TFSA now holds $30,000. In the RRSP, your part has grown to $30,000 and CRA’s part has grown to $20,000. If you withdraw $10,000 from your RRSP and your tax rate is still 40%, you’ll get to keep $6000 from your part and CRA will get $4000 from its part. This shows that if your tax rate stays constant, the part of your RRSPs savings that represents your forgone consumption grows at the same pace as your TFSA savings. The main consideration that tips the scale in favour of one registered plan or the other is changes in your tax rate. RRSPs look better when your retirement tax rate is lower than it was when you worked. TFSAs look better if your tax rate increases in retirement. There are other considerations that affect the RRSP to TFSA comparison, such as differences in withholding taxes on U.S. dividends and the Home-Buyer’s Plan, but the main concern is tax rates. The idea of forgone consumption was explained on page 278 of the 2008 federal budget as well as by Gordon Pape in the third edition of his book Tax-Free Savings Accounts – How TFSAs Can Make You Rich. Unfortunately, Pape fails to use the idea of forgone consumption correctly in recommending whether to hold U.S. dividend-paying stocks in an RRSP or a TFSA. Pape goes on to say “That actually may be a better deal than holding the U.S. shares in an RRSP or RRIF, and that’s because withdrawals from those plans are taxed at your marginal rate.” This analysis is wrong. When you properly account for forgone consumption, holding the U.S. shares in an RRSP works out better than holding them in a TFSA. So here’s the scenario: you’ve got savings in both an RRSP and a TFSA and plan to hold some Canadian and U.S. stocks. The question is which account should hold the Canadian stocks and which one should hold the U.S. stocks. Remember that an RRSP holds not only your forgone consumption but also CRA’s share. Based on a 40% tax rate, if you hold 300 shares of a U.S. company in your TFSA, you could have held 500 shares in your RRSP (300 shares for you and 200 shares for CRA). If the shares pay a $1 per share dividend, the TFSA would grow by US$300 less 15%, or US$255. In the RRSP case, your part grows by US$300, and CRA’s part grows by US$200; you end up with US$45 more in the RRSP case. It may be galling to grow money for CRA, but you’re still better off with U.S. stocks in your RRSP instead of your TFSA. Pape observes that while the 2013 contribution limit for TFSAs is only $5500, “the maximum allowable RRSP contribution for high-income earners in 2013 is $23,820.” This is true enough, but a little misleading. An Ontario earner who is allowed the maximum RRSP contribution is in at least the 43.41% tax bracket. His forgone consumption on a $23,820 RRSP contribution is only $13,480. This is still quite a bit more than the TFSA limit of $5500, but the gap is smaller than it first appears. Of course, this difference is for high-earners. An Ontarian making $40,000 is in a 20.05% tax bracket and has an RRSP contribution limit of $7200. The forgone consumption on this size of RRSP contribution is $5756, which is not much different from the $5500 TFSA contribution limit. Of course, lower earners need to be wary of having a much higher effective tax rate in retirement than they had while working because of income-tested government benefits like the GIS. Low-income earners are usually better off saving in a TFSA. The concept of forgone consumption is important for making sensible choices about contributing to RRSPs and TFSAs and for choosing investments within these accounts.